It's hard to believe that only three weeks ago the year started with the coast of Cornwall getting struck by giant waves, strong winds and high tides. This created the perfect storm and created thousands of pounds worth of damage around the coast of Cornwall. From broken roads in Newquay to damaged piers in Portreath, Fistral beach bar had it's foundations ripped out and Perranporths beach now has a totally new look not forgetting Sennen where the biggest waves were watched by lots of storm chasers. This weekend is starting to look like it will be taking on a similar pattern. 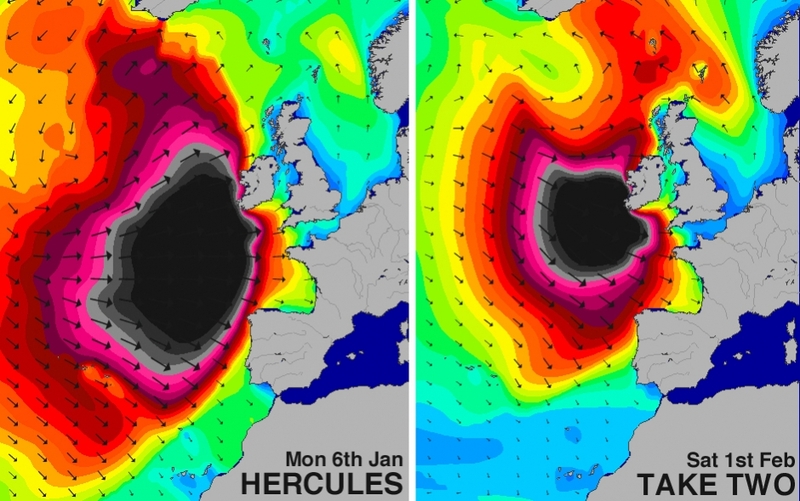 Lots of rain is already forecast for the weekend but in addition to this there are again strong winds and high spring tides and yes you've guessed it another massive swell! Checking out magic seaweed they have covered an article comparing the two storms and although this weekends storm is looking to be slightly smaller than the one three weeks ago it is still forecast to be a large dangerous storm that contains huge swells wrapping around Cornwall's coast. I will naturally be out with my camera again this weekend to witness this storm to provide images for my blog so check back in a few days to see what happens this weekend!